High-powered satellites built by Hughes Space and Communications Company (HSC) began bringing true direct broadcast satellite (DBS) service to homes throughout North America in 1994. The spacecraft are HS-601 body-stabilized models ordered by DirecTV, Inc., a unit of Hughes Electronics Corporation. DirecTV-1, DirecTV-2 and DirecTV-3 are collocated at 101 degrees West longitude and are used exclusively by DirecTV. Collectively the three satellites have the capacity to deliver more than 200 channels of entertainment programming to subscribers that are equipped with DSSTM digital home receiving units, which feature an 18-inch dish. To provide the high satellite power necessary for such small antennas, the DirecTV-1 spacecraft has 16 transponders powered by 120 watt traveling-wave tube amplifiers (TWTAs). The TWTAs were reconfigured to provide eight channels with 240 Watts of power on DirecTV-2 and DirecTV-3. The amplifiers are suitable for analog or digital signals, and are capable of transmitting high-definition television (HDTV) signals and compact disc-quality audio as well. The satellites operate in the BSS portion of the Ku-band spectrum (12.2-12.7 GHz) and employ circular polarization. Depending on configuration of the transponders, they can deliver 48 to 53 dBW radiated power over the contiguous United States. An Ariane 4 rocket carried Ariane-44L H10+ into space on Dec. 18, 1993. An Atlas-2A rocket boosted DirecTV-2 on Aug. 3, 1994. 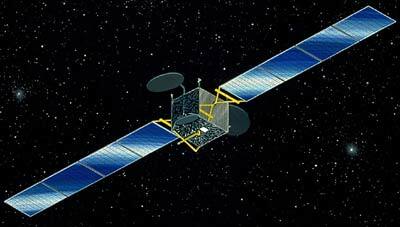 DirecTV-3 was launched on 9 June 1995, on an Ariane-42P H10-3 rocket. The boosters take the spacecraft to geosynchronous transfer orbit. The spacecraft's integral liquid apogee motor then raises it to geostationary orbit 22,300 miles (36,000 km) above the equator. The flight-proven bipropellant propulsion system includes not only the 110-lbf Marquardt apogee motor, but also a dozen 5-lbf thrusters for stationkeeping during each satellite's 12 years in orbit. Each DirecTV spacecraft measures 23.3 feet (7.1 meters) across with the two transmit antennas deployed, and 86 feet (26 meters) long from the tip of one four-panel solar array wing to the other. These arrays generate a combined 4300 Watts of electrical power, backed up by a 32-cell nickel-hydrogen battery for uninterrupted power during eclipse. The spacecraft weigh around 3800 pounds (1727 kg) at beginning of life on orbit. An innovative graphite antenna system makes its debut on the DirecTV-1 spacecraft. The transmit and receive reflectors feature a specially contoured surface that requires only one, rather than multiple, feedhorns to provide an optimal signal. The composite material is so light that each 8-foot-diameter transmit antenna weighs less than 20 pounds. The antennas are aligned in a unified structure to provide a significant improvement in antenna pointing performance. The HS-601 body is composed of two main modules. The bus module is the primary structure that carries launch vehicle loads and contains the propulsion, attitude control, and electrical power subsystems. The payload module is a honeycomb structure that contains the payload electronics, telemetry, command and ranging equipment, and the isothermal heat pipes. Reflectors, antenna feeds, and solar arrays mount directly to the primary module, and antenna configurations can be placed on three faces of the bus. Such a modular approach allows work to proceed in parallel, thereby shortening the manufacturing schedule and test time. A spacecraft control processor (SCP) aboard the DirecTV1 satellite failed on 4 July 1998. Control of the satellite was automatically switched to the spare SCP and the spacecraft is operating normally. A spacecraft control processor (SCP) aboard the DirecTV 3 satellite switched off on 4 May 2002 and is disabled. The control of the satellite was automatically transferred to the spare SCP and the spacecraft continued to operate normally. There was no interruption of service. DirecTV 3 was moved to a graveyard orbit in October 2002 but returned in 2003, when it was leased to Telesat, which uses the satellite as backup for its troubled Nimiq-2 at 82 degrees West under the designation Nimiq-2i. It has been moved in 2004 to back up Nimiq-1 and is now operated under the name Nimiq-3.